Sue Weller lives and paints in Boyertown, PA. Taking inspiration from the tranquility of the local area, she finds many landscapes, barns, and old buildings for the subject of her watercolors. What others see an old, rundown bar, Sue sees its internal beauty and captures its essence. Sue has been drawing and painting since childhood and is mostly self- taught. in addition to discovering new techniques of her own, she has also taken many courses at various art and design schools. Since she takes yearly painting grips to Cape May, NM, Nantucket, MA, and a multitude of other locations in Vermont and Pennsylvania. 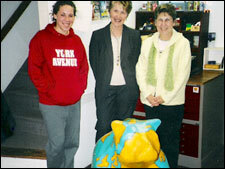 Over the years Sue developed skills in many different media including tole painting, oils, and woodcarving. Watercolors are her favorite medium in which to work. The light, airy feeling created by watercolors enables Sue to use many colors without overburdening the subject with heaviness. Original artwork is available in many sizes. Selected paintings are available in digital prints and note cards. Sue is unable to accept commissioned work at this time due to other commitments. 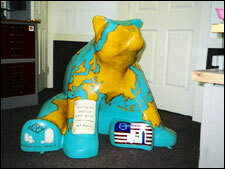 Sue Weller's artwork is currently being show at various southeastern Pennsylvania art shows and "The Open Door Gallery in Lewisbug, PA.
Each bear in the Bear Fever project is unique to both the sponsor and the artist who creates it. 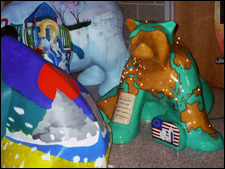 Behind each bear lies the story of its own rise from a plain white bear to the wonderful works of art that adorn all of Boyertown. So, just like all the rest, Teddy Bearsecker was put into the hands of Susan Weller, a former fourteen-year employee of Drug Plastics and Glass Company. 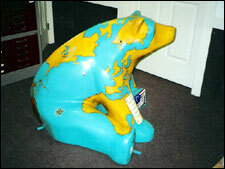 Susan claimed that the most difficult and challenging part of the project was not so much the actual decoration of the bear but the decision about the concept and design for it. And the inspiration for the design happened in her shower. She had thought first about a design involving flowers because the Bieseckers love their garden. But then she decided she wanted something that would more directly represent Drug Plastics and Glass Company. Finding the perfect symbol was where her shower came into play. It was in the shower that the idea hit her. Susan had picked up a brochure that week which displayed the company’s various factories and distribution centers throughout the world. What better way to display these stations than on a three-dimensional globe? 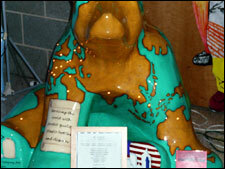 So, this is how Teddy Bearsecker started his journey from a white bear to a bear that can show you the world. Susan got started right away and claims she received quite a geography lesson mapping out the countries’ outlines and finding as close to exact city locations as possible. Although proud of her creation and her part in the Bear Fever project, Susan noted, “We can finally eat on the kitchen table and my husband’s glad I can finally get some sleep.